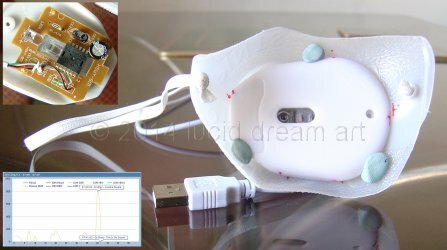 Followers and readers of my blog may well remember my previous optical mouse hack for REM eye movement detection and lucid dreaming back in August 2014. That project known as DreamCaptcha relied on a direct USB connection to a nearby computer. Hopefully after having a bit more time I can now move on from that limitation by experimenting with a wireless mouse set-up instead. The layout and construction is very similar to the earlier USB mouse hack. In fact I kept the milk carton shell and the elastic as before. Even the white tack to temporarily hold the base in is taken from that project era. However there were obvious benefits and certain obstacles to overcome during the whole modification process, most of which included the weight and power considerations, amongst others. Added a new channel: FILD – to augment the traditional finger-induced lucid dream (FILD) induction technique. It slowly counts up and drops back to zero when the mouse is tapped or moved. If it climbs high enough, an audio track will play. Wake up in the middle of the night and then go back to bed. When you are tired and about to drift off again, launch the app. Then place your fingers on the edge of the mouse and pretend that you are playing piano or typing on a keyboard. The trick is to move your fingers as gently as possible, maybe flip the mouse and tap directly on the sensor. Every few minutes, especially when you hear the audio track play, perform a reality check: try to push your index finger through the mouse or use your other hand to pinch your nose closed and try to breathe through it. Slowed down the Button TCMP processing and added feedback for dashes. Dots are anything under a second, dashes are anything over and you have 10 seconds to complete a letter. Added a new channel: Button TCMP, which interprets Morse Code patterns from mouse clicks and forwards them to the keyboard input. A quick click is a dot and anything longer is a dash. It is disabled by default so it needs to be enabled under plugins. I recently came across Michael Paul Coder’s latest FIELD update on Lucidcode which was of great interest to me. Basically this program is an upgraded version of his mouse control reader program for the LucidScribe platform. The program, via the algorithm, could now detect the delicate movement picked up by the small camera sensor in the mouse where it would play a short soundtrack after several ‘movements’ over a short period of time. It would be hoped that the mouse optics could be used as a form of REM eyelid movement or detection method, which might prove useful as a help in regard to lucid dreaming. It should be noted, hardware wise, that using an optical mouse in this way is not a new idea where the LED is directly replaced with an IR counterpart. Added a new channel: Mouse TCMP, which interprets Morse Code patterns from mouse movements and forwards them to the keyboard input. A small movement, above 32 is a dot, and anything above 100 is a dash. It is disabled by default so it needs to be enabled under plugins. It will type into any application that has focus and accepts keyboard input. Added a channel to detect eye movements from the infrared LED sensors operated out of mice. It is disabled by default because it is very sensitive, so it needs to be enabled under plugins. Added the installer to the source code. Updated the reference to the interface. Removed the 10 minute delay so that the audio track plays as soon as the mouse button is released.